Who says two objects cannot occupy the same space? Not me! This is not a trick design feature. I am stacking fireplace mantles simply because I have too many hearths and mantles, and too few places to put them. So I placed this deep black hearth directly over the opening of the flat pine fireplace mantle. To the unsuspecting eye, it all blends together. Let me go on record stating that I do not collect fireplace mantles. I stated that for my husband’s sake. Charles is not convinced because I keep bringing them home. It’s not my fault. I keep finding them. They are too nice to be relegated to the local transfer station or the power co-generation facility. (I remember when we simply called it the Dump). Presently I have five of them in the house. I just sold Faux Fireplace No. 5 at my newest space at 101 Treasures. Charles is thrilled, because this one had been relocated to the garage next to his squat rack and barbells, rendering his space useless for most of the winter. When my shop space includes a back wall, a fireplace mantle or hearth provide an appealing backdrop for staging a faux room. 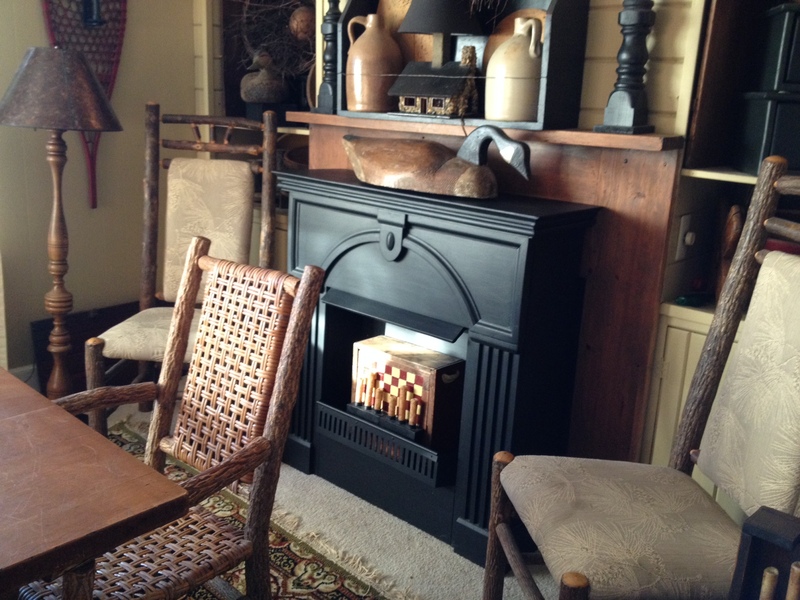 The fireplace is always a focal point in a room, and this works well in a store front as well. When featured in my shop space, faux fireplaces provide a strong design element that brings cohesion to all the other items within the “room”. If someone actually wants to purchase the mantles it’s a bonus, even though it requires a total redesign of the shop space. But I’m OK with that. The empty room is my blank canvas, and I love the creative process. This Black Beauty will leave my dining room this week, and make it’s way to the shop. Spring is coming, Charles can move his barbells out to the driveway, to free up garage space for my next acquisition.